The FAA-450 Antenna Analyzer is an open source project built from STM32-F7 Discovery board. 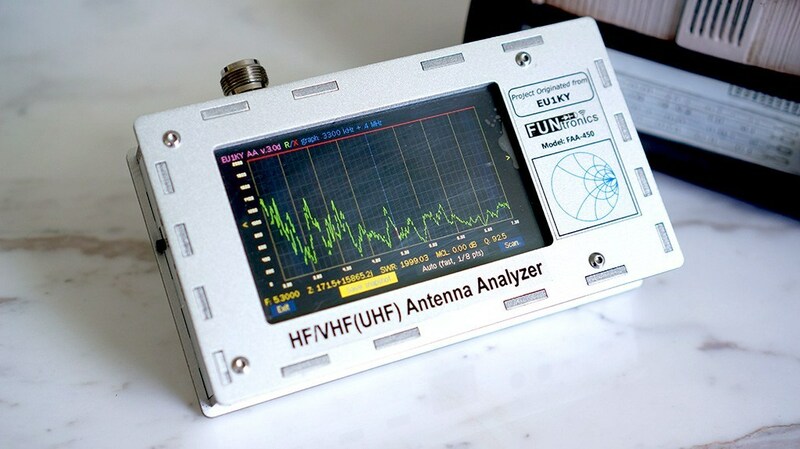 This project originated from “EU1KY Antenna Analyzer V3”, which features with BIG COLOR TFT LCD, CAPACITIVE TOUCHSCREEN, HF/VHF(UHF) frequency coverage, built-in TDR function, and multiple scanning curves besides with SWR. These features may outperform many expensive antenna analyzers present on the market. The analyzer utilizes the DSP technology to analyze the sampled and lower converted (10KHz) V & I signal and derive the their magnitude ratio and phase difference. The calibrated measured results could be veryaccurated for amateur radio purpose. So, an Open-Short-Load calibration is required to compensate transmission line influence on measured parameters before the final usage. Moreover, the device is able to work up to 450 MHz for some less accurate measurements. (Using 3rd harmonics of both signal and LO above 150 MHz, or above 200 MHz if properly confgured). The FAA-450 comes with an aluminium enclosure which consists of 6 sheets of 3mm aluminium plates, all are in silvery anodic oxidation. A cell of 18650 Li-ion battery is needed to power up the analyzer, and you can switch the analyzer to the charging mode if a USB power source is connected. It will stop the charging process if the battery cell is fully charged. Due to the international shipment regulations, the KIT or the fully assembled unit does not contain a 18650 battery, and the users should prepare one by themselves. Also, the analyzer comes with a 16G TF card for storing the calibrated files and saved measurement results, and this could be a creative feature of this analyzer.